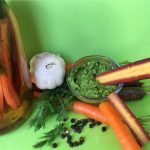 This fresh and flavorful recipe uses lacto-fermentation; creating a crisp pickled carrot that tastes spectacular with a pesto made from the carrot tops. Gorgeous, fresh carrots get lightly pickled in the most beneficial way with lacto-fermentation. Many pickling recipes call for vinegar, but a simple salt brine is the easiest and healthiest way to pickle foods. Fermented foods are highly nutritious and easily digestible. 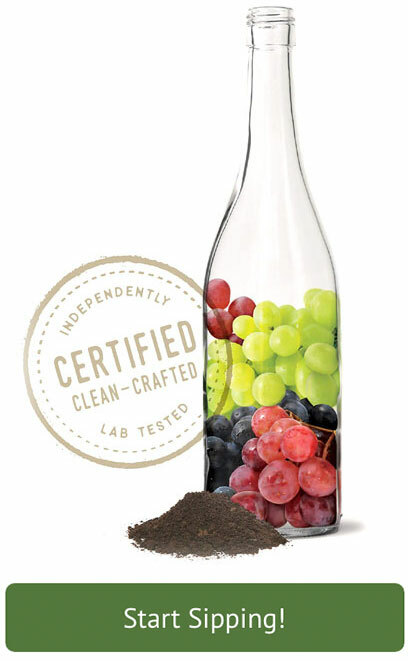 Fermentation basically pre-digests foods, making the nutrients more bioavailable, and, in many cases, fermentation either creates additional nutrients or removes toxins from the foods. Ferments that use live, lactic-acid producing bacteria intact are amazingly supportive of digestive health, immune function, and general well-being. 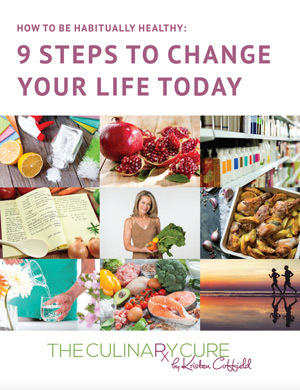 Fermenting your vegetables is a great way to create your own super foods! Carrots provide the highest source of provitamin A carotenes among commonly consumed vegetables. Two carrots contain four times the RDA of vitamin A. Carrots also provide excellent levels of vitamin K, biotin, and fiber, as well as vitamins C and B6, potassium, and thiamine. The health benefits of carrots are many. They are an excellent source of antioxidant compounds that help to protect against cancer and cardiovascular disease. Carrots also promote good vision, especially night vision. The beta-carotene in carrots provides protection against macular degeneration and the development of late-in-life cataracts, which are the leading cause of blindness in seniors. Lots of great reasons to eat more carrots! 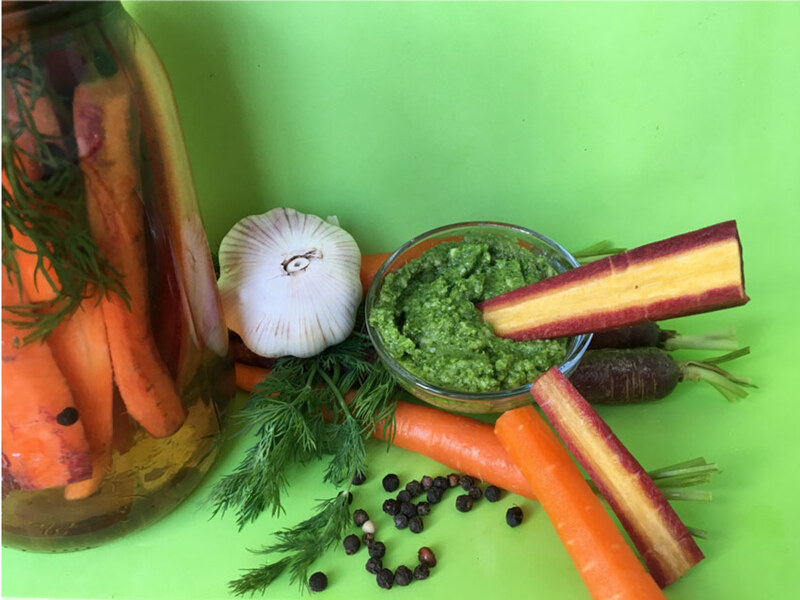 This simple recipe increases the benefits of carrots with lots of gut friendly bacteria. Once you see how simple it is to lacto-ferment carrots, you will be excited to brine many more vegetables. I love how easy it is to create different flavor profiles of your fermented foods by adding herbs, spices, citrus, garlic and onions. The overwhelming health benefits of fermented foods should be reason enough to make pickling a part of your culinary repertoire, but the delicious flavors achieved during this simple process will have you craving more. Slice carrots in half lengthwise and trim from bottom to the correct length of your jar. Bring water, salt, bay leaves, peppercorns and garlic to a boil, then cool to room temperature. Pack the carrots into the jar with the dill and top with brine mixture. Carrots must be completely submerged. If you have leftover brine, you can do a second smaller jar with other vegetables. Place jar of carrots in cool, dark spot for 3-4 days. Ideal temperature is 55-72 degrees, so a cellar or wine storage area works well. Carrots can continue to brine for up to two weeks. Pickled carrots keep refrigerated for up to 2 weeks. Serve with carrot top pesto as a dipping sauce. Place nuts and garlic in a food processor and pulse until coarsely blended. With the food processor running add the olive oil and pepper flakes. Serve as a dip with pickled carrots.